Listen to the Doctor Who Knows..
Dr. Shigeaki Hinohara is no ordinary doctor. Some might say he is one of Japan’s living national treasure. 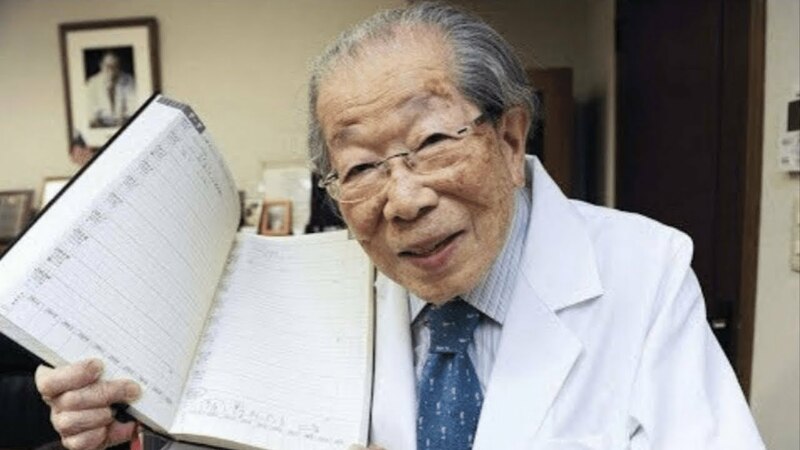 Born in 1911, he is 104 years old as of this year (2015), and he is probably the world’s oldest and longest-practicing physician and educator. Who is better qualified than this good doctor to advise us on how to live a long and happy life? After World War II, Dr. Hinohara had the vision to establish a world-class hospital and college: St. Luke’s International Hospital (Seiroka International Hospital) and St. Luke’s College of Nursing, both in Tokyo. Today, they are among the top medical organizations in the country, and he still serves as chairman of the board of both institutions. In addition, he still busy healing patients in the hospital, as well as teaching students in the college. The good doctor holds positions in many other important organizations, as well. He is a patron of the Asia Pacific Hospice Palliative Care Network (APHN); chairman of the Life Planning Centre in Tokyo; and founder of the “New Elderly Movement.” He has published more than 150 books, one of which is the bestseller Living Long, Living Good, which has sold more than 1.2 million copies. Dr. Hinohara’s life mission is to share the secrets of living a long and happy life. In this article, I will share his sage advice. We could all learn a lot from him. 1 – Energy comes from feeling good—not from eating well or sleeping a lot. Children often have so much fun they might even forget to eat or sleep. We should emulate the children and have fewer rules about mealtimes and bedtime. Let’s have more fun. My comment: I think it is equally important that we should have nutritious food and enough sleep. Feeling good means maintaining a positive and happy mental attitude. When we feel stressed, we deplete all of our energy. Feeling good energizes our system. Indeed, energy comes from feeling good. 2 – Do not be overweight. Dr. Hinohara found that those who live long lives are not overweight. The good doctor himself is careful about what he eats. For breakfast, he drinks coffee, milk, and orange juice with a tablespoon of olive oil. He believes that olive oil is great for the arteries and also maintains healthy skin. For lunch he only drinks milk with a few cookies, or sometimes nothing at all when he is too busy to eat. For dinner, he eats vegetables, fish, and rice. Twice a week, he gives himself the special treat of 100 grams of lean meat. My comment: I think we eat too much meat, as well as too much junk food. Personally, I try to reduce my meat consumption, especially red meat. Fresh vegetables and fruits are two essential groups of nutritious foods. Instead of animal meats, a better option is eating fish, especially deep sea fish. 3 – Always plan ahead. Dr. Hinohara always has a full schedule, often planned at least a year in advance. His calendar is packed with lectures, hospital work, and many other appointments. He also likes to have fun and is looking forward to attend the Tokyo Olympics in 2020! My comment: Now, I am not sure how planning ahead contributes to long life. Perhaps if one is as busy as the good doctor, a well-planned life could lead to reduced stress. In addition, one would have the pleasure of looking forward to all those fun activities. 4 – You don’t have to retire. Even if one wishes to retire, it should be at an older age. Age 65 is too young. My comment: Many people believe that the day they retire is the day they are free to do anything they like. There are reports, however, that retirement actually leads to the beginning of fading into oblivion and losing one’s sense of purpose. So, if you are retired like me, make sure you keep busy in your life—doing the things you like and contributing to society. 5 – Share what you know. Dr. Hinohara gives 150 lectures a year, some of them to young school-aged children. Other lectures are given to various business communities—some 4,500 of them over the years. He delivers his lectures standing up, and the talks are sometimes as long as 90 minutes. He says standing makes him strong. My comment: Well, most of us will not have the qualifications to give lectures, but the important point here is to share your knowledge with others. Do not be selfish. Be generous, and help others. 6 – Don’t believe everything your doctor says or recommends. Dr. Hinohara believes that doctors can’t cure everyone or everything. He suggests that patients ask their doctors whether they would want their own loved ones to go through the recommended procedures. If not, why cause unnecessary pain and suffering? He also thinks music and animal therapies can aid healing more than the medical community realizes. My comment: Fancy this advice coming from an experienced and well-respected doctor! I think his words are especially true in serious medical cases like cancer. The success rate of the recommended cancer treatments (e.g., chemotherapy, radiation, surgery) is very dismal indeed. Furthermore, it can give patients a false hope of being cured. To add insult to injury, these treatments are often very painful and debilitating, as well as very expensive. Some cynically refer to these treatments as “poisoning, burning, and butchering”! Some people are interested in natural or alternative treatments that may bring less suffering. 7 – In order to stay healthy, always take the stairs and carry your own belongings. In order to keep his legs and heart healthy, Dr. Hinohara takes two steps at a time when climbing the stairs. My comment: There is no substitute for exercising to maintain physical health. You can consume the best nutritious food available, but this will not keep your body fit and trim. Regular exercise is the only way. Dr. Hinohara is inspired by Robert Browning’s poem “Abt Vogler.” This poem talks about drawing a circle so big there is no way you can finish it while you are alive. All you can see is the arch, and the rest is beyond your vision. But it is always there in the distance. My comment: I think what the doctor means is that we should not restrict our imagination; we should think outside the box and beyond. Don’t restrict your life to a dead end. Let your imagination run wild. I tried to read Browning’s poem myself, but I ended up feeling like a fool, as I couldn’t understand what the poem was all about! And I didn’t see anything about drawing a big circle. 9 – The best way to overcome pain is to forget it by having fun. If a child has a toothache, and if you start playing a game with him, he will immediately forget the pain. At Dr. Hinohara’s St. Luke’s hospital, they offer music therapy, animal therapy, and art classes. He believes that hospitals should also cater to patients’ more cerebral, or spiritual, needs. My comment: I have seen people suffering from serious pain. My son was in the ICU twice, and he has been quite sick for the past year. I know how it feels to see your loved one suffering from significant pain, and I know the feeling of helplessness, realizing there is nothing you can do to take away the pain. I think what the good doctor is talking about here is the more run-of-the-mill type of pain that a person can try to forget by having fun. I don’t believe one can forget pain that is of the extreme type. 10 – Don’t be crazy about amassing material possessions. No one knows when your time’s up, and you can’t take material possessions with you. My comment: This is the tragedy of human life; other species are not like us in this way. There are lots of material objects that are desirable, and people can become obsessed with acquisition. The real problem comes when instead of enjoying the possession, people let the possession possess them. There will come a time, often as people age, when they will gradually reduce their possessions. This is what I am now trying to do. 11 – Science alone cannot cure or help people. Science lumps all human beings together. Illness, however, is individual. Dr. Hinohara believes that each person is unique and that diseases are connected to their hearts. To be able to help people and to cure their illnesses, we need liberal and visual arts—not just medical treatments. My comment: Many illnesses are also related to the patient’s mental state. I believe that those who are negative and hateful in their thoughts are more likely to get sick than those who possess a kind and peaceful disposition. This is because when the mental state is not relaxed, the immune system does not function effectively, and the person will be less resistant to external attacks. 12 – Life is most unpredictable and is filled with incidents. Dr. Hinohara relates an incident that occurred when he was 59 years old. He was on a flight from Tokyo to Fukuoka on March 31, 1970, when the plane was hijacked by the Japanese Communist League-Red Army Faction. He spent the next four days handcuffed to his seat in 40-degree centigrade heat. He treated the whole ordeal as an experiment, and he was amazed to discover how the body could slow down to adapt to a crisis situation. My comment: I certainly hope we don’t have to undergo such an ordeal. I think the good doctor is warning us that life is very unpredictable, and anything can hit us when we least expect it. We should try to be prepared. 13 – Find a role model. One of Dr. Hinohara primary role models is his father, who went to the United States in 1900 to study at Duke University, in North Carolina. We should aspire to achieve even more than our role models ever achieved. When he feels stuck, the good doctor asks himself how his role models would approach the problem. My comment: It is difficult to stand alone in this day and age. A role model can provide a sense of confidence and guidance, especially in challenging times. 14 – It’s wonderful to live long. Dr. Hinohara assures us that it is wonderful to live a long life. In our later years, we should strive to serve society. Since the age of 65, the doctor has been working as a volunteer. He still puts in 18 hours a day, seven days a week, and he enjoys every minute of his active life. My comment: To live a meaningful life, especially when a person is getting older, it is necessary to contribute one’s time for the benefit of the society. The joy of knowing that one has worked to help others is something that money cannot buy. We should all spend time helping others. You must always feel good and be full of enthusiasm and inspiration. You must always watch your diet and exercise regularly. You must always keep busy to contribute to society. May you, too, have a long and happy life. Update: From “the Japan Times” (18 July 2017) Shigeaki Hinohara, honorary head of St. Luke’s International Hospital in Tokyo — who continued practicing as a doctor even after turning 100 — died from respiratory failure today, Tuesday, 18 July 2017, the hospital said. He was 105.